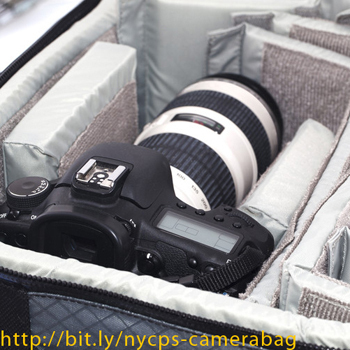 There are many, many different kinds of camera bags out there by a few dozen manufacturers. So how do you choose one? First, you need to identify your needs. Ask yourself, what does your bag need to be able to hold at a minimum? Then, consider whether you can do with less? If you are purchasing a new bag, you might want to spring clean your older bag first. Next, consider what kind of conditions you will be photographing in. In other words, will you be hiking long distances with your gear or will you drive to the site and stay reasonably close to the car? If you are walking long distances, a backpack with waist support or a waist bag will be most helpful as you will want the weight distributed between your waist and your shoulders. If you are not going far from your car, something small will work. You may also want to have a plastic bin in your car for your bag so that other things don't crush it and your bag won't roll around your trunk. If you are traveling to poor areas you may need to conceal the fact that it is a camera bag. In this case a shoulder bag that looks like a simple messenger bag can be most useful; however, if you are carrying a lot of camera equipment you may be sacrificing quite a bit. Shoulder bags do not offer a lot of support and can be very tiring to use. If you are not walking long distances and are not carrying a lot of equipment, then a sling bag may be a very good option. For the ladies reading this blog: one camera bag configuration we never suggest is a bag which looks like an expensive hand bag. There's no better way to signal to a thief that they should steal, not only your camera, but your entire bag with it! Other features to consider when purchasing a new camera bag are: a hidden rain cover, a place for your tripod, enough pockets for miscellaneous things like memory cards, pens, a note pad, passport, and expansion capability (is it possible to attach more pockets etc. to the outside of the bag?) Also note that too many pockets are also bad; you'll loose things and carry too much stuff with extra pockets.